It’s difficult, when you are a trade show manager, to watch person after person walk by without coming into your booth, or turning and leaving within a few seconds. Ideally, you’d like to have attendees come in, visit a while with sales staff, look around at the demos and take advantage of the opportunity to learn more about your offer, but they can’t do that unless the booth itself is interesting and engaging. For some exhibitors, it’s enough to have a virtual character on the aisle attracting attention, speaking about the brand and drawing attendees inside. When you want to increase the “sticky” time, CHOPS can help there, with one of his surprise elements – allowing attendees and booth guests to actually see the “man behind the curtain” doing his performance. It’s something they’ve never seen before and it enhances social currency, when they are “in the know” and want to bring their friends back to your booth. 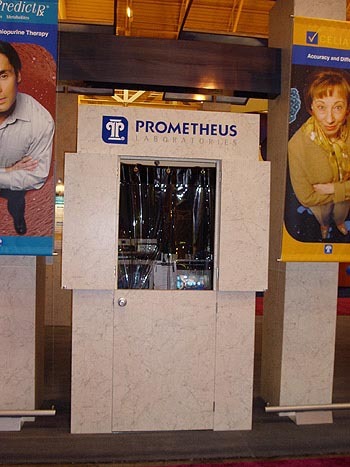 Prometheus Labs used CHOPS to pull people from the aisles of their most important trade show of the year, and to increase the time they spent inside the booth. As a result, more show attendees visited longer with the sales and account representatives, looking at their demos and discussing their important issues with openness and candor. Oh, absolutely. I think our average contact time was close to 10 minutes per customer, and in other booths, I say that, aside from the free coffee and other gifts they’re giving out, they are lucky if they are getting 90 seconds. How would it sound to have a virtual cartoon character discuss irritated bowel syndrome (IBS)?- If you are a doctor treating hundreds of patients a year for this and other related digestive tract disorders, that might not seem unusual to hear, at the New Orleans trade show for Digestive Disease Week. What might be strange is having this animation speak to you in terms that salespeople usually use. Under the guidance and planning of E-Brain’s Donna Malakoff, (www.ebrainsinc.com) Mice DisplayWorks and the Prometheus Labs (PL) team, (www.prometheuslabs.com) the company was represented in the booth by “Prometheus,” an interactive avatar with skin that looks like a marble statue. PL’s main objective was to engage those attendees who were skirting around the booth and bring them in, where one of about 20 sales reps could introduce them to PL’s systems for diagnosing and treating bowel disorders. Doctors can be a bit shy, they knew, and the marketing staff wanted to have a unique advantage. The booth manager was also very aware that her location was at the front end of an aisle, near the entrance, surrounded on both sides by two of the biggest pharmaceutical companies in the industry. The manager’s other needs were to create a “buzz” on the show floor and to deliver an improved return on investment to her company, for the budget required to support such a high-profile exhibit at their most important trade show of the year. The PL booth was designed and constructed by MiceDisplayworks of Irvine, CA, and featured the CHOPS Bubble Screen on the left, facing one direction, while Jesch’s control booth is shown in the center, facing the other side of the aisle. In the center of the booth, PL had a pair of kiosks set up to run demos and deliver product information. According to EBrains, the solution was obvious. 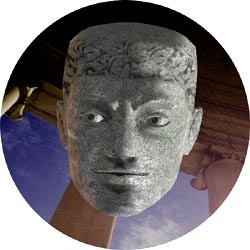 Use the virtual character to pull traffic into the booth, after engaging the attendees – The problem of getting more than a couple minutes of time with each attendee was solved by giving them more to do, once they came into the booth. 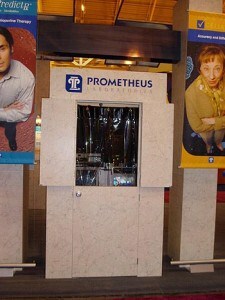 The Prometheus character caught their attention by working with a front person from the PL sales staff who would read the attendee’s name from their badge. He would start breaking the ice by asking where the person came from, how they liked New Orleans, what they did in the industry. If the person was a physician from the US, they fit the PL customer description and the character began to engage them in a dialog. However, if the person was a qualified prospect, the character began to probe to learn what was important, which issues mattered, what could be improved. A PL salesperson was also standing right there listening, until the character suggested to the attendee that taking a few minutes with a PL rep in the booth would be in his or her best interests. From there, the attendee was taken to the demo, where they received a very expensive laser pen as a gift. Finally, the rep would personally walk the attendee around the booth to where Gary Jesch was performing as Prometheus, and together they would marvel at the amazing animation system. All in all, the reps had each attendee’s attention for 10-15 minutes, gained their trust, impressed them with the wizardry of the animation, gave them a great parting gift and personal attention to their specific questions. They also made plans for follow-up after the show in most cases. 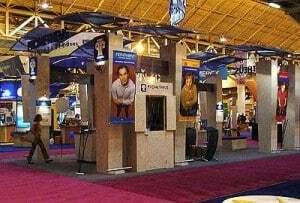 This type of booth attraction was completely new to DDW, which caused show management to marvel, and easily accept PL’s intentions to do something a little different. The constant chatter by the character was never a problem for other exhibitors and the booth’s manager was in constant control of the speaker volume coming from the CHOPS Bubble Screen display. The end result was a very happy customer in PL, buzz after the show, and plenty of hot prospects for the nationwide sales staff to work on, in the following weeks after DDW.